The most recent addition to the Sonsub fleet, the multipurpose ROV support vessel Bourbon Pearl, has completed operations in what was Sonsub's most northerly work site to date. 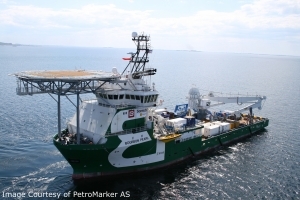 The vessel had been performing electromagnetic (EM) offshore exploration for PetroMarker AS in the Barents Sea, operating from Hammerfest in Northern Norway. With special features for deepwater intervention, the 91 metre DP Class II vessel commenced operations in June after an ROV support and light construction conversion programme. This included installation of a 100Te active heave compensated crane, helideck and new accommodation module, plus modifications for installation of the heavy weather Launch and Recovery System (LARS) and Innovator #21 – a brand new 250hp ROV.